Absolutely! The $18,000,000,000 East West Link in Melbourne was defeated and a Government toppled by people power in late 2014 using the only non-violent course of action open to them - civil disobedience. The soon-to-be-released doco Tunnel Vision (2016) makes this really clear. Won’t WestConnex make Sydney’s traffic situation better? No. It will actually make it worse! WestConnex admits this in their business case study. Due to induced demand, the traffic situation in Newtown, St Peters, Camperdown, Broadway, White Bay, the City West Link, Anzac Bridge and the Iron Cove Bridge will be bumper to bumper for much longer in both morning and evening peak hours. Rat running is inevitable. Won’t the residents of the West will be better off? Again no. The savings in road-journey times are minimal, as little as five minutes in some cases. 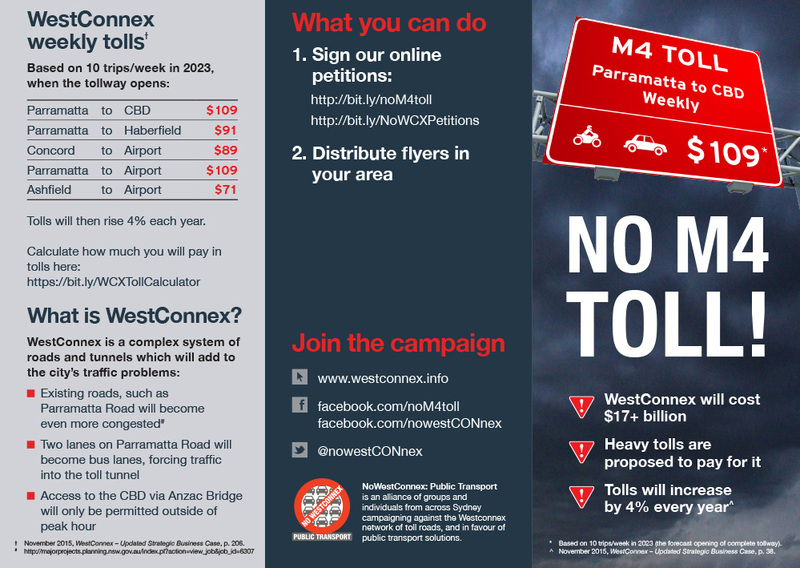 The tolls imposed will cripple some families in western Sydney. A breadwinner in Parramatta who travels to the CBD by car will have to earn another $9,000 p.a. just to pay the $5,500 in tolls! Imagine the farcical situation of having to get another job just to earn enough money to travel to your day job. Forcing this demographic to carry the burden of the toll road is simply obscene. But the Government must know what it’s doing, surely! You’d like to think so but the facts suggest otherwise. Most if not all of the recognised experts in Sydney’s transport and traffic management agree that WestConnex isn’t the solution, it’s a major part of the problem! Professor Peter Newman (Curtin University), Dr Michelle Zeibots (UTS Institute of Sustainable Studies), Mat Hounsell (Eco Transit) and Chris Standen (University of Sydney) all agree it’s an unmitigated, unnatural disaster! Cities across the world are tearing down their inner-city motorways because they’ve all proven to be counterproductive. So what’s the answer to Sydney’s traffic chaos? Simple. Spend the wasted $16,800,000,000 on public and active transport. Upgrade existing systems, extend services to more locations and make them more frequent, utilise redundant rail networks, upgrade the obsolete rail signalling system, better utilisation of freight rail, increase speeds on the rail networks through long overdue track maintenance. If public transport is accessible, reliable, efficient and cost-effective most people will use it. So is this just a waste of taxpayer’s money? 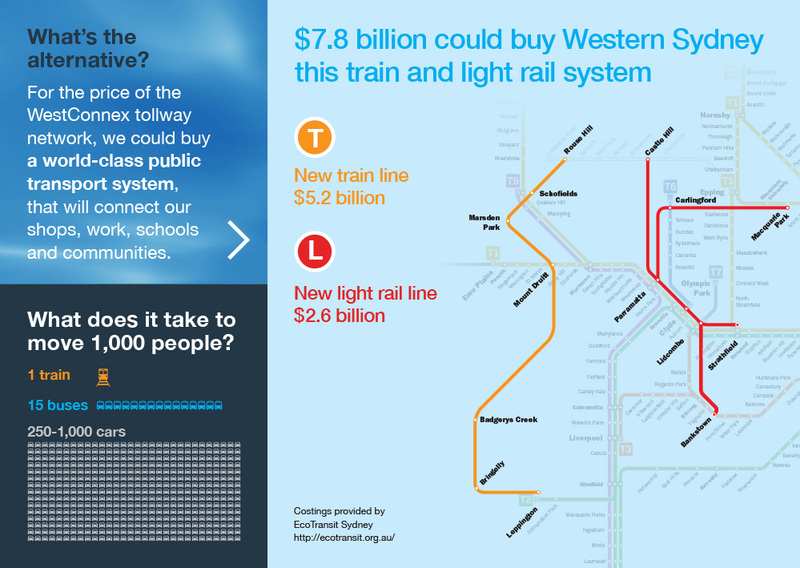 WestConnex is a shocking waste of public money! In February 2017 the Federal Auditor-General delivered a damning report re WestConnex's probity and financial underpinning. The principal contractor Leighton’s (now CIMIC, the name changed presumably to avoid the stench of corruption with their overseas tendering) and AECOM, the firm supplying the figures examined by the Australian National Audit Office, have both been associated with some monumental tunnel failures (the Cross City Tunnel here in Sydney and the Clem Jones in Brisbane are classic examples). What is the Inner West Council’s position re WestConnex? Having stated initially that he would spend no ratepayer’s $ fighting WestConnex (although the Inner West Council opposes it), in December 2016 IWC Administrator Richard Pearson revealed that Council had deep concerns about the impacts of WestConnex on local streets and communities and the State Government’s inadequate assessment of those impacts. 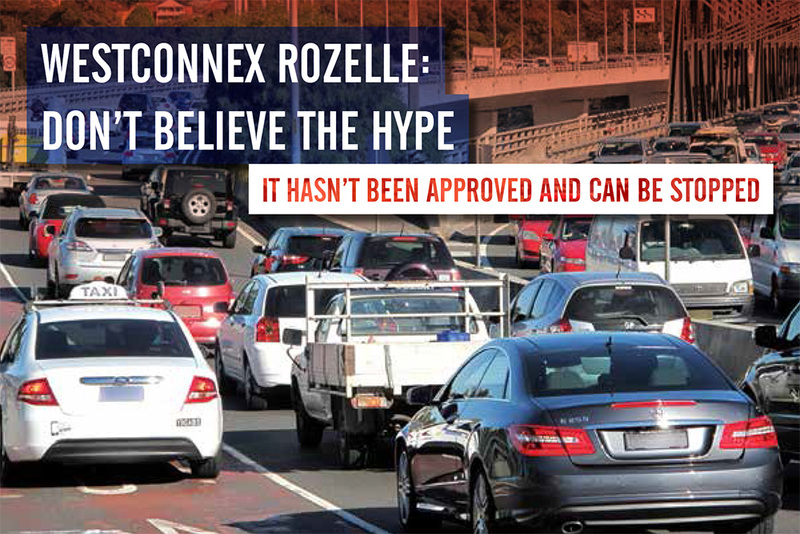 For months Council had been asking that Roads and Maritime Services provide traffic data that would allow the Council to carry out a study into local traffic impacts of each stage of WestConnex, but no data had been forthcoming. Council is now having to spend $500,000 on consultants to gather the information. 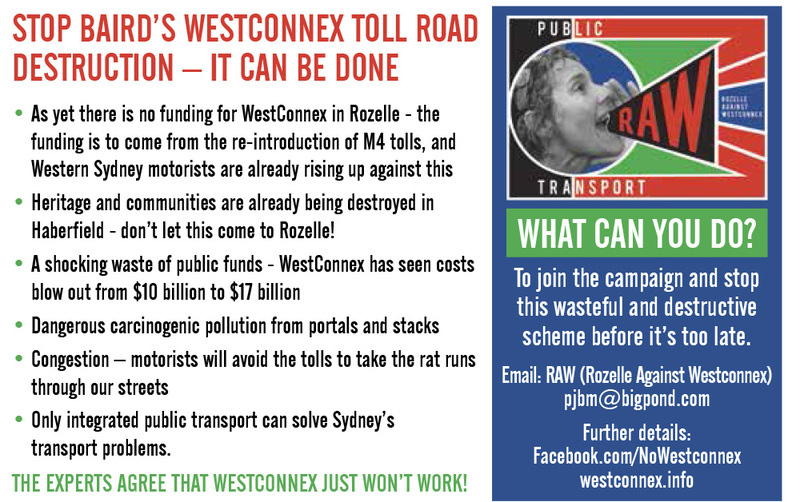 The toll companies and the construction companies are the only winners if WestConnex proceeds. When it fails the NSW Government will be forced to step in and pick up the pieces wasting even more taxpayer’s money. So it’s vital that it never gets that far! Us. All of us. All of Sydney. We and our children are the losers. If you’re a local and/or support our aims then please Join Us. If you have the time then get involved in our events, actions and demonstrations (see What Can You Do?). If not, please donate whatever you can. Deposits can be made directly into RAW’s Sydney Credit Union account… BSB 802-084, A/C 154772. A crowd-funding site is being established for big-ticket items (our next project is to raise $6,000 to publish a 12pp broadsheet for distribution to 60,000 people across the inner west).